I drink a lot of smoothies and I usually add a 1/2 cup of “milk” to each one. I use either soy or almond milk, but I much prefer the benefits of almond milk, especially for my post long runs. As with most things I regularly consume, I started to wonder what went into making almond milk. More importantly, could I make it myself. Is the process horribly wasteful? 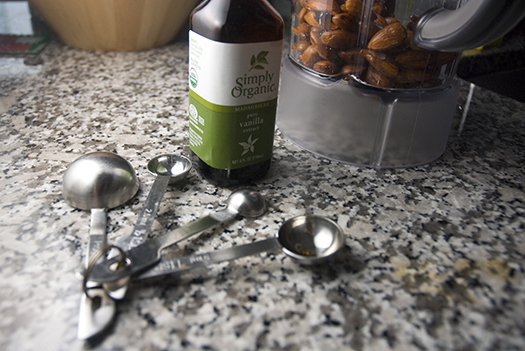 How hard could it be to make almond milk from scratch? It is so not hard. In fact, it’s so easy, I’m kind of surprised it took me as long as it did. 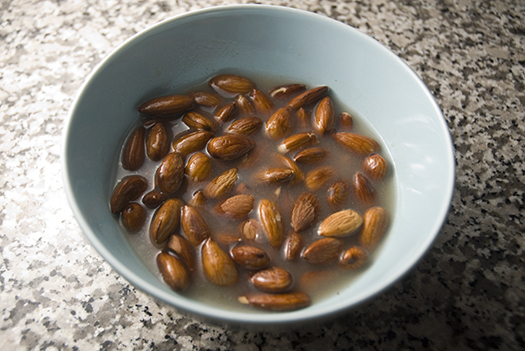 Pour a cup of almonds into a bowl. Add one cup of water and set it aside for at least 6 hours, or overnight. 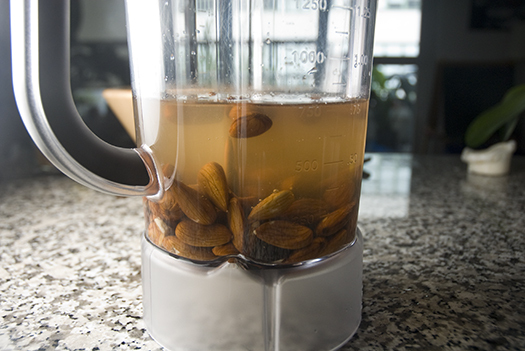 After the almond soak, strain the excess water and add the almonds to a blender. Add your dates (if using). Add the vanilla extract (if using). Add 3 cups of water. And turn that puppy on. I use a combination of the “purée” function and the “liquify” function. Strain your mixture. I do at least three strains. For the first one I use a pasta strainer, as the finer one takes a bit longer to drain. Below, is the pasta strainer. You will notice its holes are a lot larger than the the finer ones you’ll see later. After I pass it through the pasta strainer once, I change to a finer one. 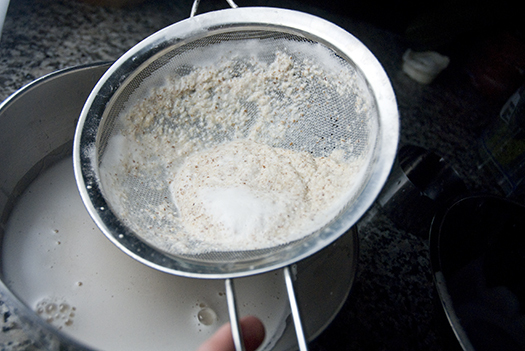 I use a flour sifter to do this. 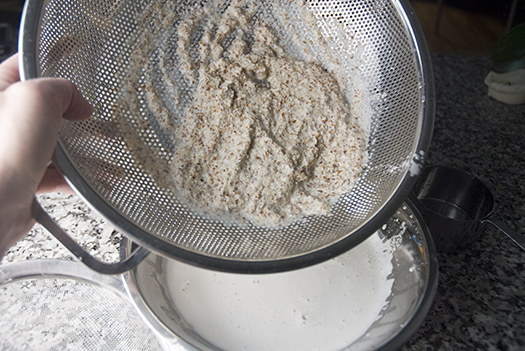 You can use something similar, or, if you have one, use a cheesecloth. I do this step at least twice. Feel free to use your hand to gently push the moisture through. You want to get as much milk out of the pulp as possible. It will last for 3 or 4 days in the refrigerator. Although I wouldn’t recommend it, I have used mine after that. Lastly, I loathe wasting food. I have a tendency to make whatever I can with leftovers. If I make a swiss merengue icing, I use the yolks to make shortbread cookies. If I make a key-lime pie, I will use my egg whites to make an angel food cake. All that to say, I save my pulp. I have made gluten-free, chocolate chip almond cookies using the pulp, which I will share with you at a later date. 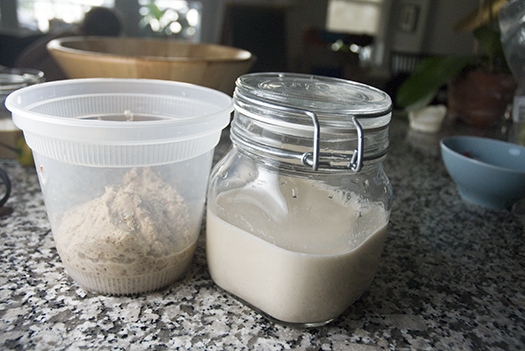 You can also use it for breads, rolls, and possibly even crust, although I haven’t tried that just yet. I will in time! This is so super easy, there really aren’t any. I think the only thing I can say is that if you don’t have a blender you can try using a food processor, although, I always have way too much leakage whenever I do. So, be aware of the food processor. Flavor this as you wish. When I first started making it, I only added vanilla extract. I started adding dates whenever I realized I had a ton of dates on-hand and didn’t want to waste them. Since then, I’ve been adding dates to my milk. They so aren’t necessary. If you like sweater milk, add some sugar! I reckon a bit of maple syrup might taste good as well. Sky’s the limit, folks! Flavor it up. Previous Post Animals, Running, and a Favor From You. huh. That seems very doable (I have all ingredients/tools on hand!) – thanks!